Hello again my crafty friends! This is my 3rd post today, can you believe it? That's a first for me LOL! To see my other posts today, just click on the links above. I'm joining Papertrey Ink today for their March Blog Hop! The theme today is to use some sequins on your project. So I decided to make a masculine birthday card today as I have a few birthdays coming up in April and have no masculine cards. I used Papertrey Ink's Vintage cream cardstock for my card base and main layers and I used papers from the My Mind's Eye 6x6 paper pad Stella Rose Collection. I love these papers because they bring out the browns and blues. I used my ebosser to cut out the ticket border by Papertrey Ink and then stamped it with it's coordinating stamp set, Just the ticket. I used the "ticket to celebrate" stamp for the tickets and stamped it with Momento rich cocoa ink. Then I inked up the frame and sentiment "Happy Happy Birthday"from Fillable Frames #1 and cut it out using its coordinating frame die. 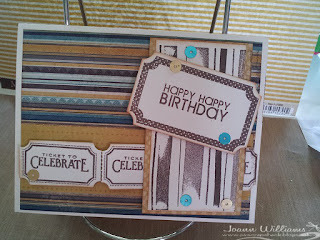 The layer behind the "Happy Happy Birthday" sentiment was stamped using a background stamp from Hero Arts. To finish the card off I added some tan and blue sequins. Below is a peek at the inside of the card which has another sentiment from the "Just the ticket" stamp set. I hope you enjoyed my card today. If you want to join Papertrey Ink's March blog hop, you have until 11:30pm EST. tonight to link up your creation. 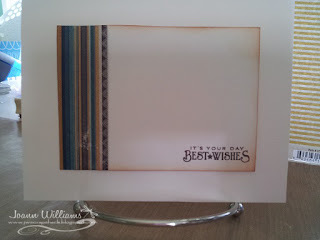 I am also entering this card in the Sweet Stop SSS203 sketch challenge. 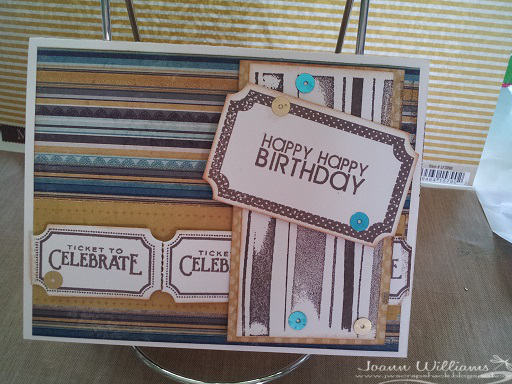 Love the patterns and textures in your card!! Fabulous!! What a great masculine card Jo! I love, love Paper Trey Ink, and I want that darn ticket die and stamp set. lol It's on my wish list and now I want it even more after seeing your fabulous card! Well done my friend!!! Great card! I love your mix of patterned paper! A wonderful card!I have to work on masculine cards...I am not good with that!Your card is AWESOME! Wow, what a clever way to incorporate the sketch into your creation. Thanks for sharing on The Sweet Stop Sketch Challenge.